Aston Villa must avoid the "panic" of life in the Championship at all costs, says their former European Cup-winning striker Peter Withe. 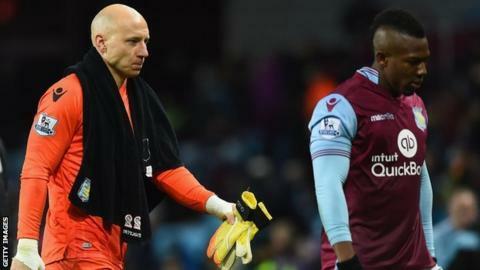 Villa are rooted to the bottom of the Premier League table, seven points adrift of Sunderland in 17th place. "If you look at the Championship and think, if you go down into that mire, it's very difficult," 64-year-old Withe told BBC WM 95.6. "We've seen it with a lot of clubs - they find it very hard to get back." Relegation would mean Villa missing out on a share of the new £5bn TV deal which kicks in from next season, and although parachute payments would soften the financial blow, Withe feels that makes dropping down a division even more of a challenge. "They do have a cushion but it's hard," said Withe, who won 11 England caps and later managed the Thailand and Indonesia national teams. "I look at the managers that have gone in the Championship and, for me, that's because there's a little bit of a panic situation that 'we all want to get into the Premier League'. "That makes it so much more difficult to get out." Saturday's 3-2 defeat by Watford left Villa, under new head coach Remi Garde, still without a home win this season and Withe is struggling to stay optimistic over their survival chances. "To look at the games they've played and they way they've played, it's desperate - you just can't see where they're going to get the points from," he said. "They just haven't got any confidence and to lose to Watford you're thinking maybe this is the year we go down. "The biggest thing for me was losing Christian Benteke and Fabian Delph - if you haven't got anyone scoring the goals like Benteke did you haven't got a cat-in-hell's chance."